Purpose: Review Purchase Order information pertaining to a contract using ctcLink. Purchasing contracts are used to establish pricing terms and conditions to be used on purchase orders for a particular supplier. These can be for specific items or for any items that are purchased from that supplier. In this topic, you will review information on all POs associated with a particular contract. Use the Review Contracts by PO page to review information on all purchase orders associated with a particular PO contract. Use the SET ID and Contract ID field to enter the identification number of the contract. 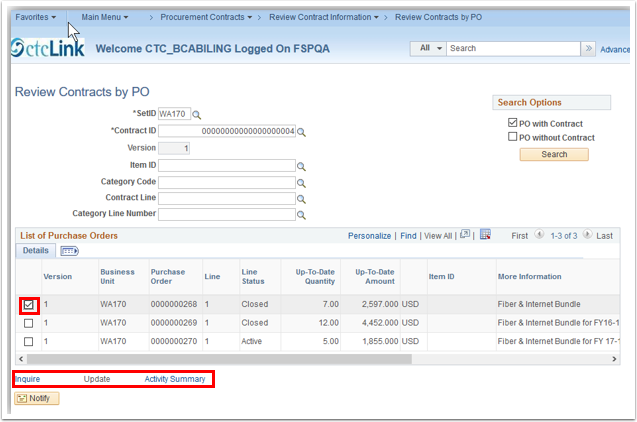 Select the PO with Contract under Search Options to view purchase orders that reference the selected contract. Once you make your selection, the Search button becomes active. 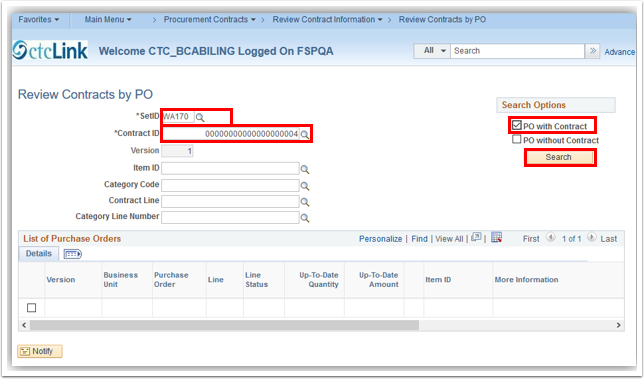 Notice that the PO Contract Line page displays a list of purchase orders associated with the specified contract. Select a purchase order line for which you want to view additional information. Select the appropriate PO line by adding a check mark in the box. This allows you to view additional information about the selected purchase order. You have successfully reviewed purchase orders associated with the specified contract.